The Beard Team USA Blog: Americans storm Berlin, strike gold! America's new super hero, Toot Joslin, took first place and earned a gold trophy in the Sideburns category at the World Beard and Moustache Championships held in Berlin, Germany, on October 1, 2005. Toot is seen here flanked by Italy's Bruno Panza (left, second place) and Germany's Uwe Wankmüller (right, third place). As expected, Germany dominated the event, taking gold in 14 of the 17 categories. While the Americans didn't exactly hoist the stars and stripes over the Brandenburg Gate as they had hoped, they were invited along with all other competitors to appear on stage in front of the famous gate (the symbol of Berlin, once inaccessible in the no-man's land separating East and West Berlin) during celebrations on German Unity Day, October 3. "This was a building year for us," says Phil Olsen, self-appointed captain of Team USA, who was pleased with the results. "We'll be back next time with a bigger and even stronger team." 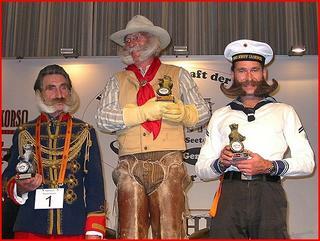 The next World Beard and Moustache Championships will take place in Brighton, England, on September 1, 2007. Toot is still waiting for the traditional congratulatory phone call from President Bush. Phil, When are you going to remove the comments from these non-beard-loving pretenders that says they like the site then try to hock their own site. As a man that has grown a Van Dyke every summer since I was 18, it upsets me that these shameless carpetbaggers are taiting the best website on the net!!! Keep it up and we are all proud of your steller work in Berlin!!! Done! The delay was due to technical problems. People without beards are welcome to comment here, as are people who don't like beards. But, people trying to use this blog to advertise their crap will have their comments DELETED. Hear all about it! A Tahoe loco wins at the World BMC! See ya on the snowy slopes! Congrats and I'm sure it was a great time. How do they get their hair to stay like that? Do they use Gel or hair spray? Or like head hair can you train the hair to lay a certain way? I think most of them use commercially available hairsprays, waxes, and gels. Some are tight-lipped, regarding the info as secret. which term do you prefer for a mustache...cookie duster or pube lips? Its really something interesting and great post. no one can think about the almond be the next Viagra. Everyone knows about Water melon works as the Viagra. Its natural treatment. I have always felt that blogging has been an art where people express their experiences in the best manner.This is something that is very informational.